Do Enlarged Lymph Nodes Offer Clues About Cancer? In medical circles, the term "lymph node cancer" is not generally used, as it runs the risk of being misinterpreted and causing confusion. That said, lymph nodes are often key structures in the growth, spread, and detection of many different kinds of cancer. 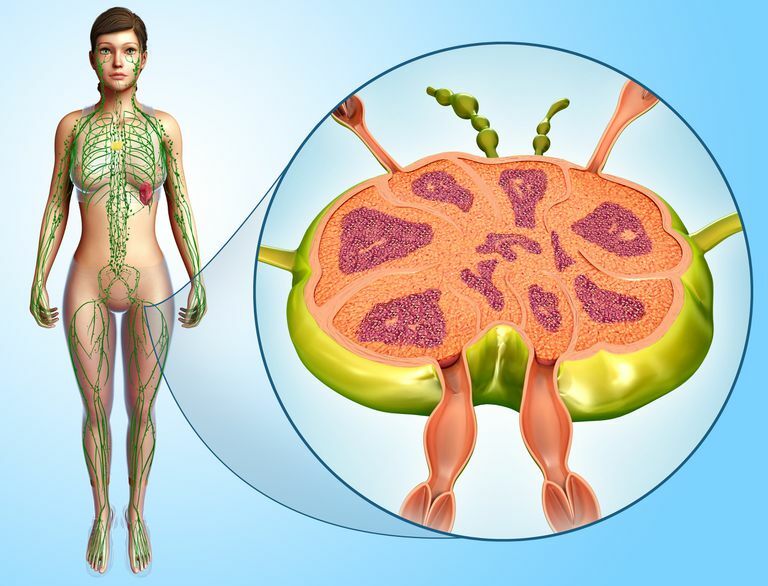 Each of us has hundreds of lymph nodes, and each lymph node filters the fluid it receives from lymph vessels that collect or drain lymph fluid from a particular zone in the body. Lymph fluid from the fingers, for instance, joins fluid from the arm and circulates back to the chest. Some lymph nodes are deep inside the body, near the heart, between the lungs, or deep within the abdomen, draining and filtering lymph fluid from internal organs and tissues. Once the lymph nodes filter the lymph, the fluid returns to the chest and is circulated back into the bloodstream. Infections, cancer, injuries, and other conditions or diseases can all cause a node, or a group of lymph nodes, to swell or enlarge. Swollen lymph nodes indicate some process, potentially a disease, is at work, but it is the other symptoms and findings that help pinpoint the problem. For instance, ear pain, fever, and enlarged lymph nodes near the ear could be clues that there might be an ear infection or cold. Likewise, lymph nodes beneath the jaw (submandibular nodes) drain the mouth, or oral cavity, and enlargement in these nodes could indicate an upper respiratory infection, or dental disease, or various other conditions. Most enlarged lymph nodes are caused by an infection, and this is especially true in children. When more than one area has swollen lymph nodes, this is called generalized lymphadenopathy. Some bacterial and viral infections can cause generalized lymphadenopathy. Certain medicines, immune system diseases, and cancers like lymphoma and leukemia can also cause this kind of lymph node swelling. Cancer can appear in the lymph nodes in two basic ways. It can start in the lymph nodes, developing from the immune cells, or, more commonly, it spreads to the lymph nodes from a cancer of a different tissue, such as breast tissue or lung tissue. If cancer cells break away from a tumor and spread through the lymph system, they may end up in the lymph nodes. When cancer grows inside lymph nodes, it usually affects the lymph nodes that are near the tumor. Surgeons may be able to remove a primary cancer, such as breast cancer, and the lymph nodes that drain the site may be removed as well. This is referred to as a lymph node biopsy or a lymph node dissection, depending on the number of lymph nodes taken for analysis. Microscopic study, special staining, and evaluation of the lymph nodes by pathologists can help doctors determine what kind of additional therapy may be necessary after the surgery. Lymphoma is a cancer that develops in the lymph nodes from cells of the immune system. The two main types of lymphoma are non-Hodgkin (about 90% of cases) and Hodgkin (about 10%). The most common symptom of Hodgkin lymphoma is a lump (or lumps) possibly in the neck, under the arm, or in the groin (enlarged lymph nodes), however not everyone with Hodgkin has obvious enlarged lymph nodes as a symptom. The lump doesn’t usually hurt, but the area may become painful after drinking alcohol. Hodgkin disease can affect lymph nodes inside the chest, and the swelling of these nodes might press on the windpipe, leading cough or even trouble breathing. Whether its Hodgkin or non-Hodgkin lymphoma, individuals with the same disease can have differing symptoms when they come to medical attention. Leukemia is a cancer of the early blood-forming cells. Most often, leukemia is a cancer of the white blood cells, but some cases of leukemia develop from other blood cell types. Swollen lymph nodes can be a feature of leukemia. For instance, with chronic lymphocytic leukemia, as the disease progresses, enlargement of the lymph nodes, spleen, and liver develops. American Cancer Society. Lymph Nodes and Cancer. http://www.cancer.org/cancer/cancerbasics/lymph-nodes-and-cancer. Why Are Lymph Nodes Important in Your Body? What Are Enlarged Retroperitoneal Lymph Nodes? What Are Enlarged Axillary Lymph Nodes? What are Paratracheal Lymph Nodes? What Are Cervical Lymph Nodes?